But I love the points game, and am always up for a challenge! 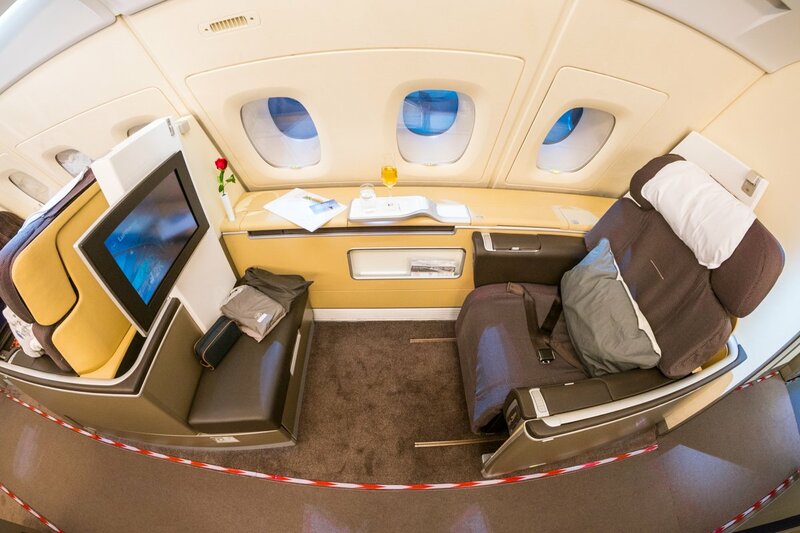 I need to be in Europe for work at the same time each year for an exhibition, so 11 months before departure I booked a confirmed Singapore Airlines business class award seat between Frankfurt and Sydney via Singapore Airlines for 105,000 miles. 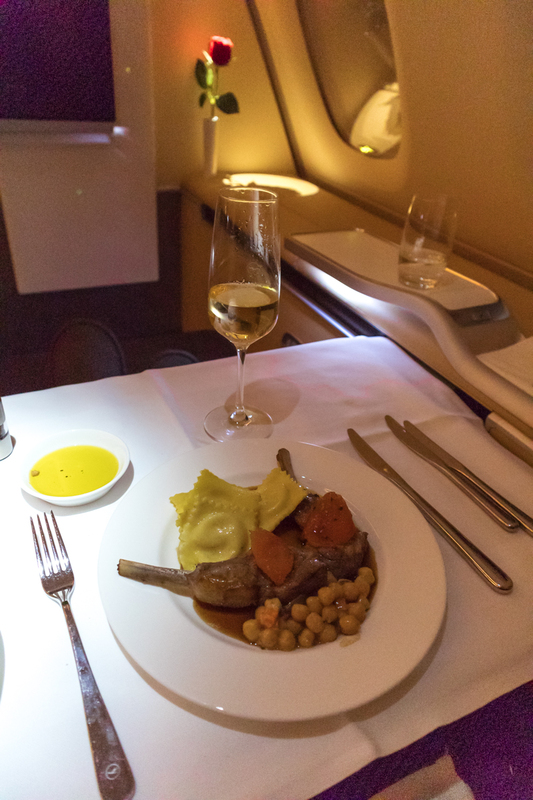 I also made sure I had another 24,000 KrisFlyer miles to cover the total 129,000 miles required for the Frankfurt to Singapore first class Lufthansa flight, so I’d be ready to use them at any time. Then, I jumped on ExpertFlyer and set up alerts for +/- 2 days around my ideal date of departure and also developed a way for it to text me — I really didn’t want to miss that important notification! Finally, 11 months later (and just 2 days before I left Sydney for Frankfurt), that magic text I had been waiting for buzzed. You can bet I was on the phone to Singapore Airlines within seconds. Within 5 minutes, my original flight was canceled, and I was booked in the last window seat on a flight just 9 days away! Oh happy days! 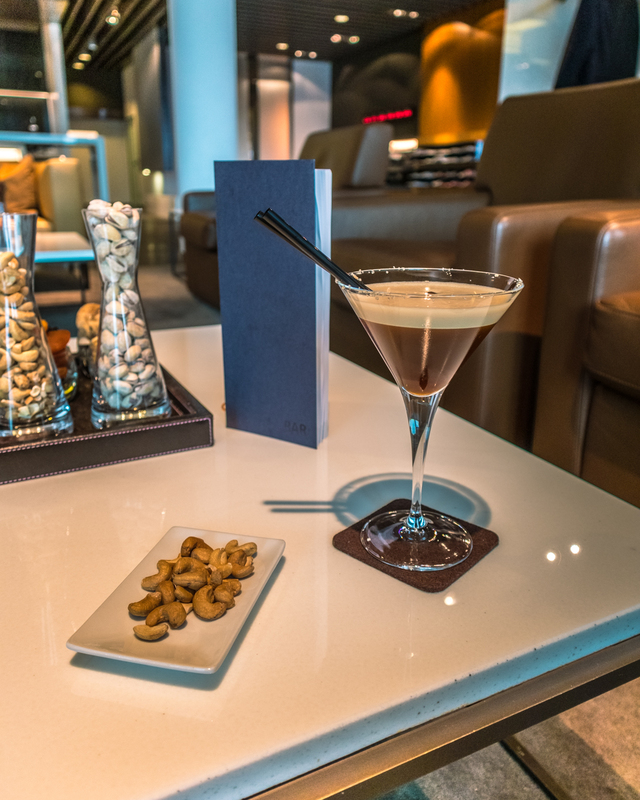 Hot Tip: There are many ways to earn Singapore KrisFlyer miles for this redemption, including transferring Amex Membership Rewards or Chase Ultimate Rewards points directly into your Singapore KrisFlyer account. 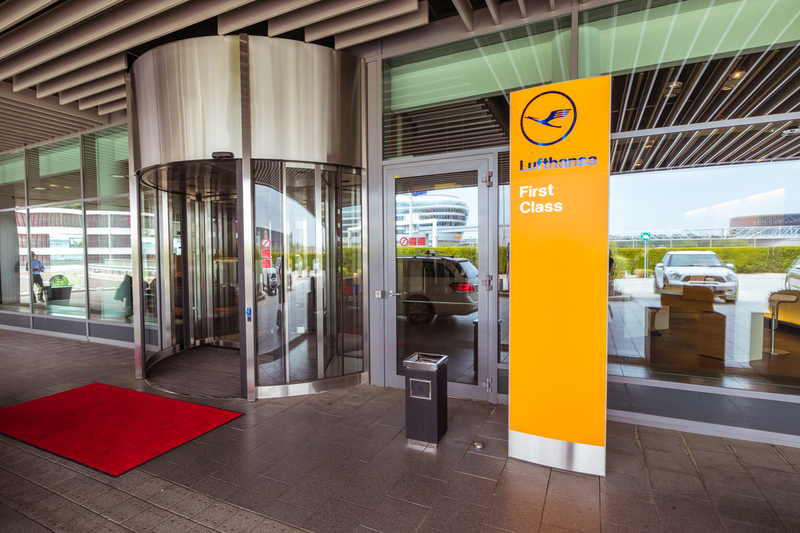 But that’s not the only way; see our guide on how to book Lufthansa First Class for other options! 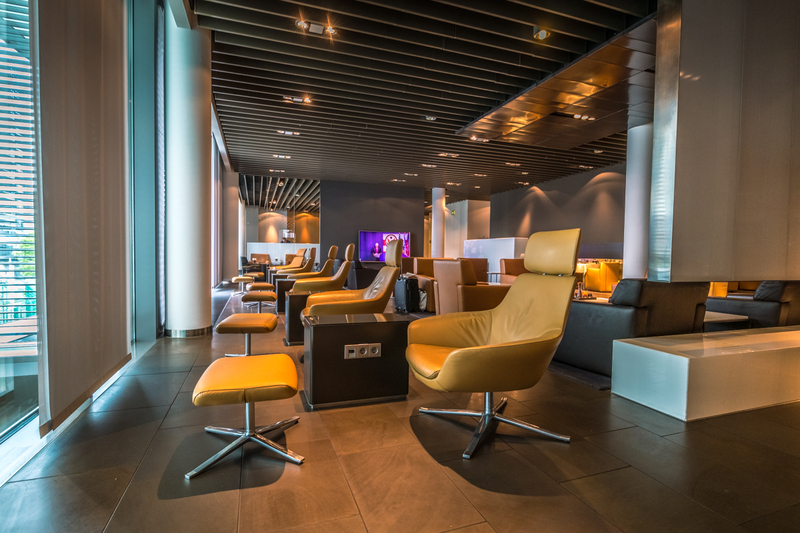 The Lufthansa first class experience flying out of Frankfurt starts on the ground at their dedicated 1,800-square-meter First Class Terminal. I arrived at midday via taxi and was greeted by the lovely Gladys, my “personal assistant” for the morning, who asked me where I was flying to. When I answered Singapore, she replied, “Wow, that’s not till 10pm!” She obviously realized that I intended to make the most out of this experience. I handed over my passport and entered through the private security screening, which took less than a minute. 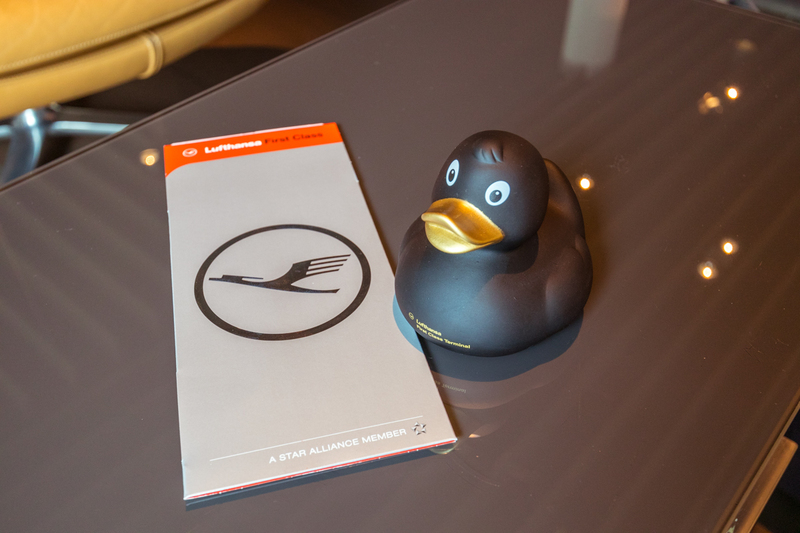 By the time I was shown to a seat, another team member had come over with my boarding pass and one of the famous Lufthansa First Class rubber ducks. As it was my first time here, Gladys gave me a full tour of the Terminal. 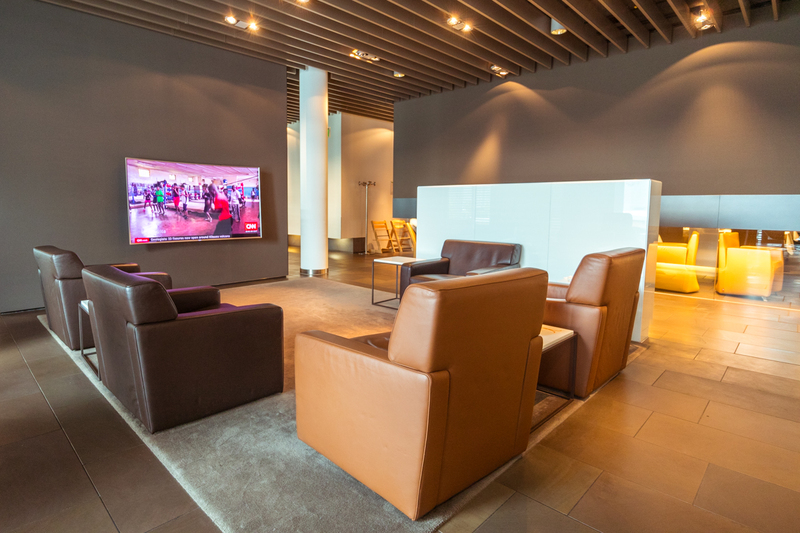 The Terminal is beautifully designed with dark stone floors, neutral colored furniture, dark grey walls contrasting with timber, and high gloss white panels and tables. 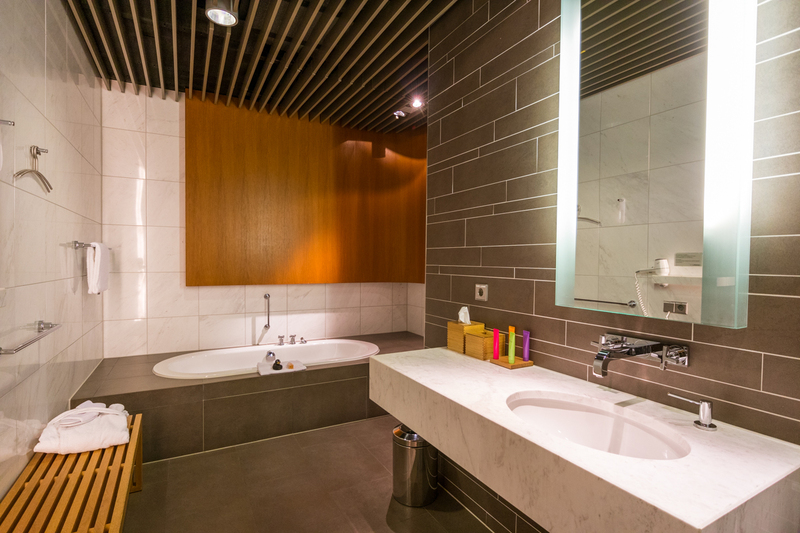 The lights are kept dim to create a calm environment that is also super quiet. I’m sure you could hear a pin drop. When I arrived, there were only 3 other passengers, and I only ever saw up to 8 passengers later in the evening — it felt incredibly exclusive. 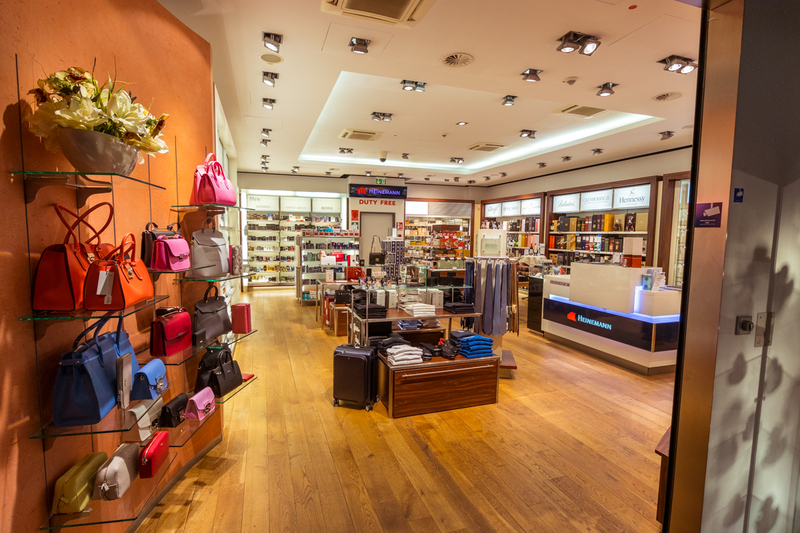 There is dedicated duty-free store just after security. 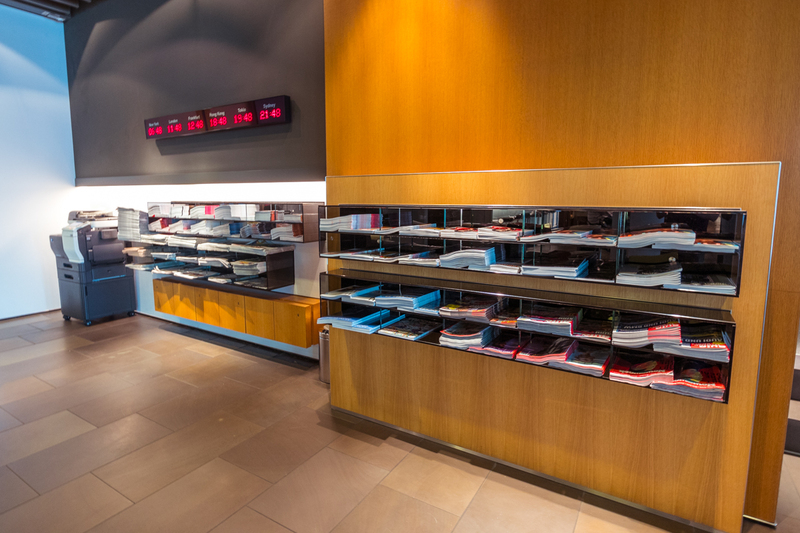 You’ll find a large selection of magazines and papers from around the world. 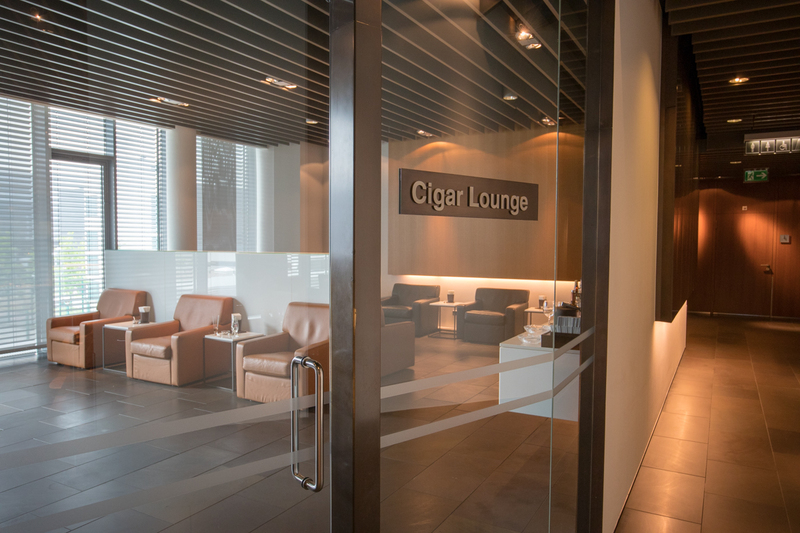 There’s also a cigar lounge! The bar is one of the most well-stocked bars I’ve seen. The numbers are impressive: 130 whiskeys, 29 vodkas, 21 different types of water(!! 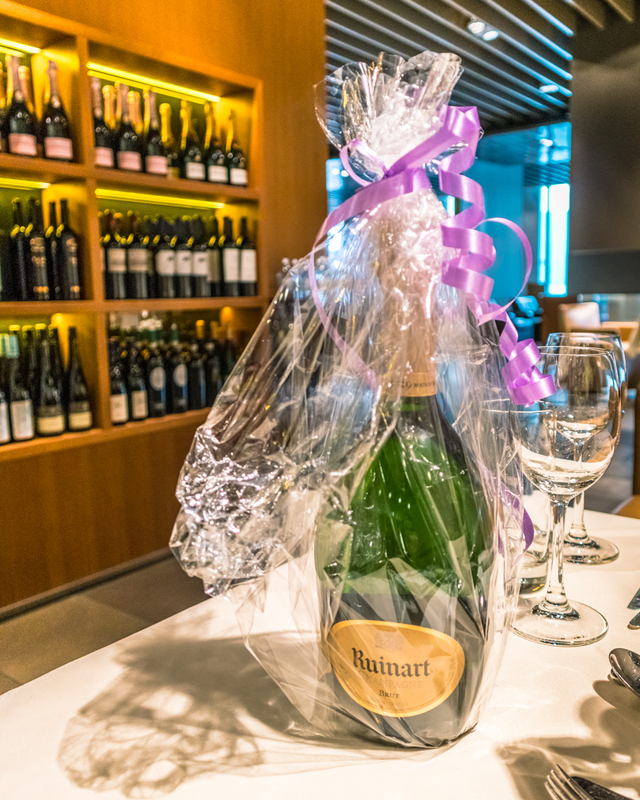 ), 20 liqueurs, 5 champagnes, and so much more. You certainly won’t go thirsty! Nor will you go hungry. 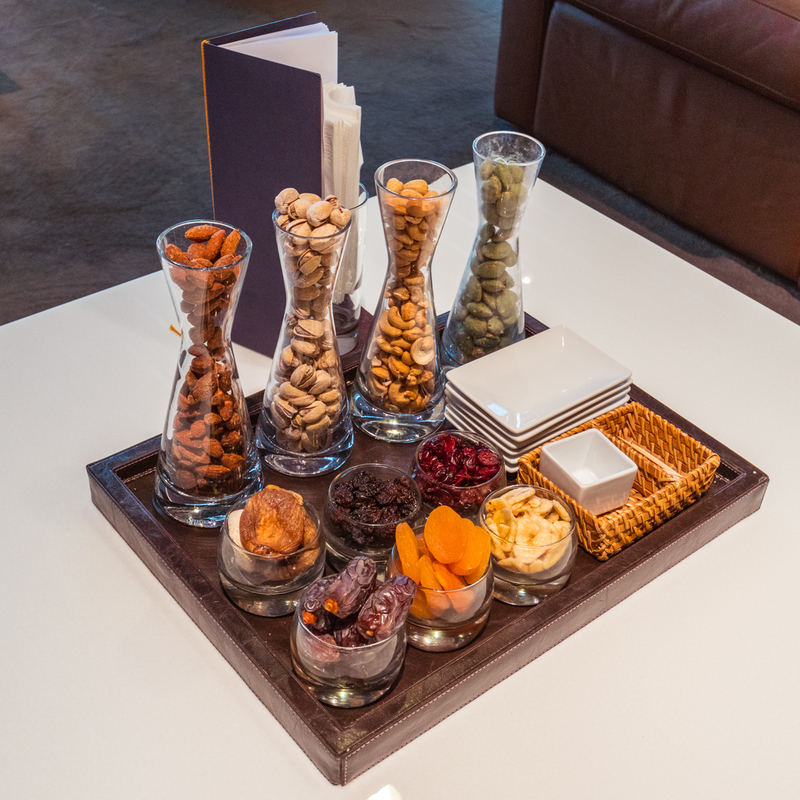 A selection of nuts and snacks sit on every coffee table and are constantly topped up. 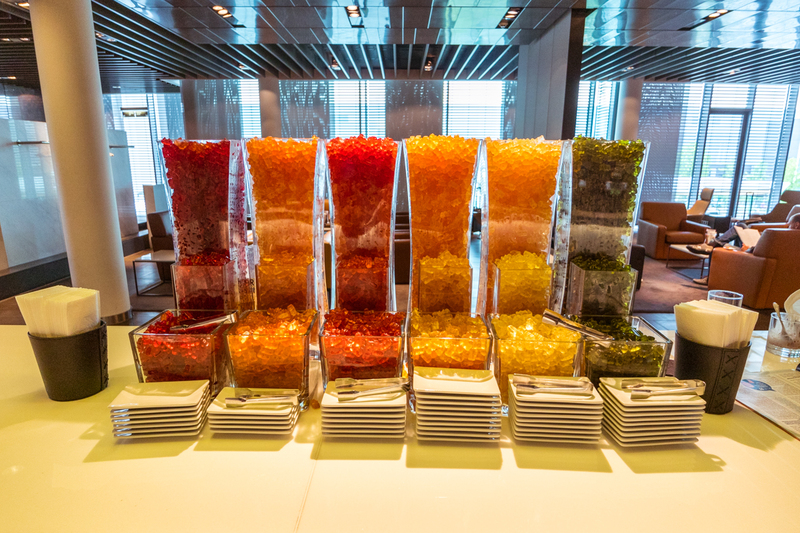 If that’s not enough, 6 towers of gummy bears sit between the bar and lounge room. 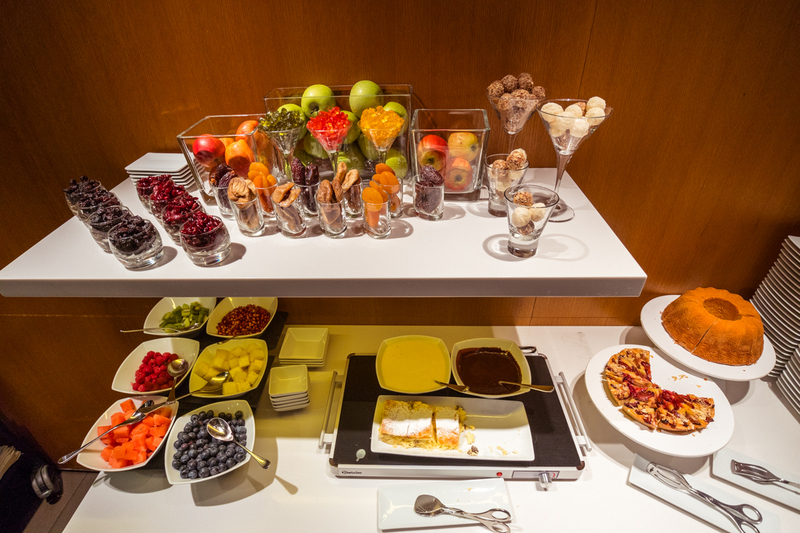 For something more substantial, there is a dining room with extensive buffet as well as à la carte options from the menu. Our Terminal tour finished on the lower level departure area, where I would later pass through a revolving door and into a car to be driven to the plane. Gladys even asked if I had a preference of vehicles to take me to the A380. Porsche Panamera or Mercedes S-Class? Decisions, decisions! I said I would honestly be happy with either. 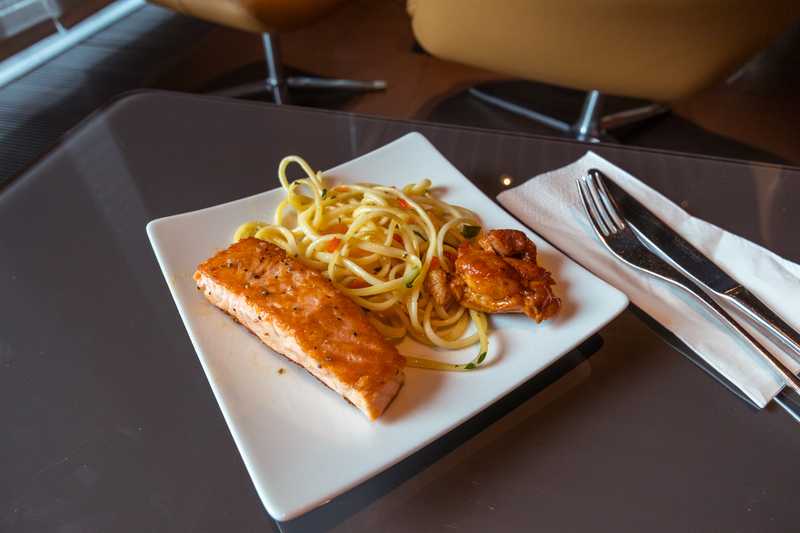 I decided to have a light lunch from the buffet, where I sampled the hot options including grilled Atlantic salmon, spicy chili chicken, and linguini with prawns…all impressive for buffet dishes. 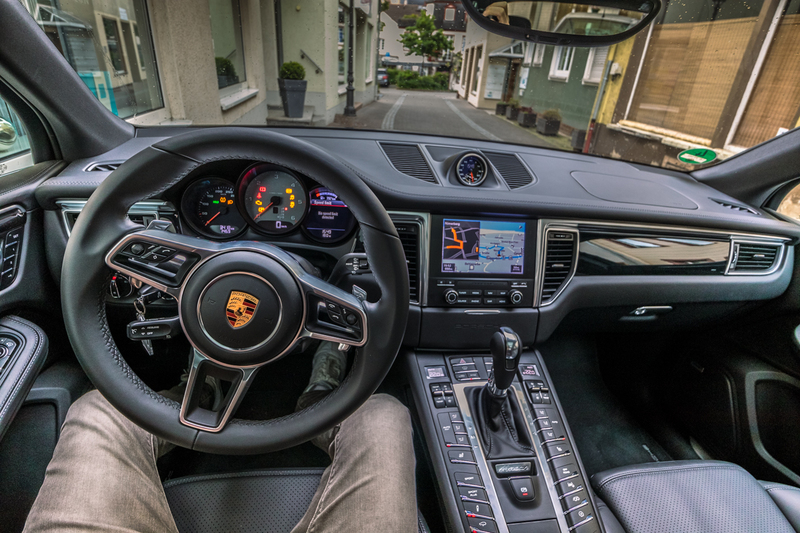 As part of the Lufthansa first class experience, there is the option to rent a Porsche through Avis for just €99 including all taxes, fuel for 3 hours, and 150km of use. 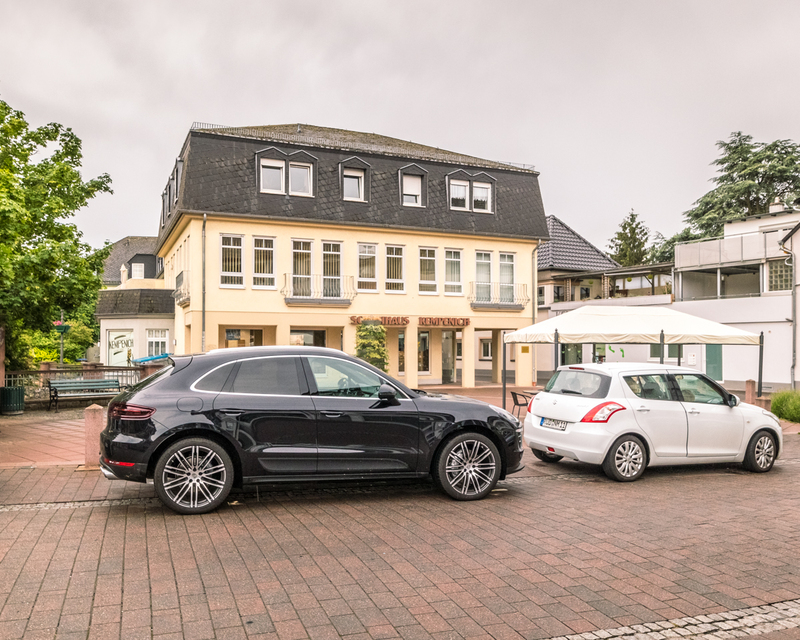 Despite pre-booking on the Avis website 3 days earlier, they had no 911 vehicles left, so they offered a Diesel Macan. Though it wasn’t what I had booked, I had accounted for 3 hours — so I might as well see some of the Frankfurt countryside I had been looking forward to. The Lufthansa website promotes 4 routes that are pre-loaded into the Porsche’s navigation, which is perfect for out-of-towners. A few days earlier I had downloaded the PDF and decided which route to drive. However, this is when things started to deviate from the promoted experience. As I jumped in the car and followed the instructions from the PDF, I couldn’t find any pre-loaded routes. I went back to the Avis customer service desk to ask them how to load the maps, and they just handed me a printed booklet…the same booklet I downloaded earlier! After a few phone calls, the Avis team said the maps haven’t been loaded into the navigation systems for over a year now. So now I’m in a $120,000 Porsche, in a foreign country, driving on the wrong side of the road, on my own, without anywhere to go, and it’s just started to storm. What could possibly go wrong?? 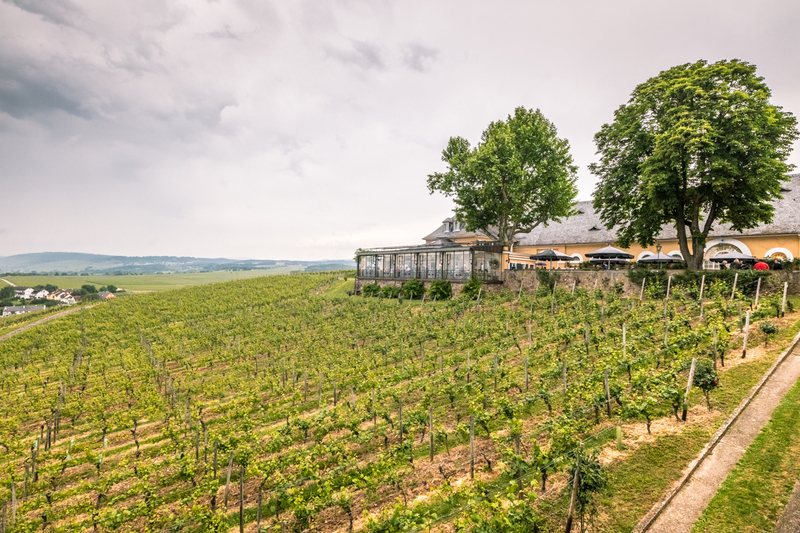 Not knowing where to go, I set the navigation to a point of interest listed on the route I picked out: Schloss Johannisberg, the first Riesling wine estate in the world. 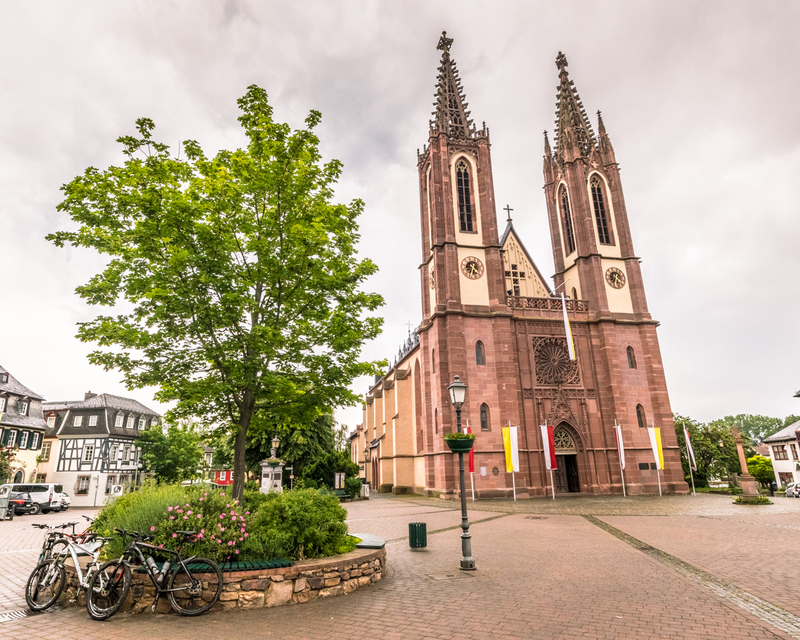 After a brief visit to the winery and with some time to spare (and no more points of interest to navigate to), I drove down to Geisenheim and decided to park the car, take a walk around the town, and grab a coffee. 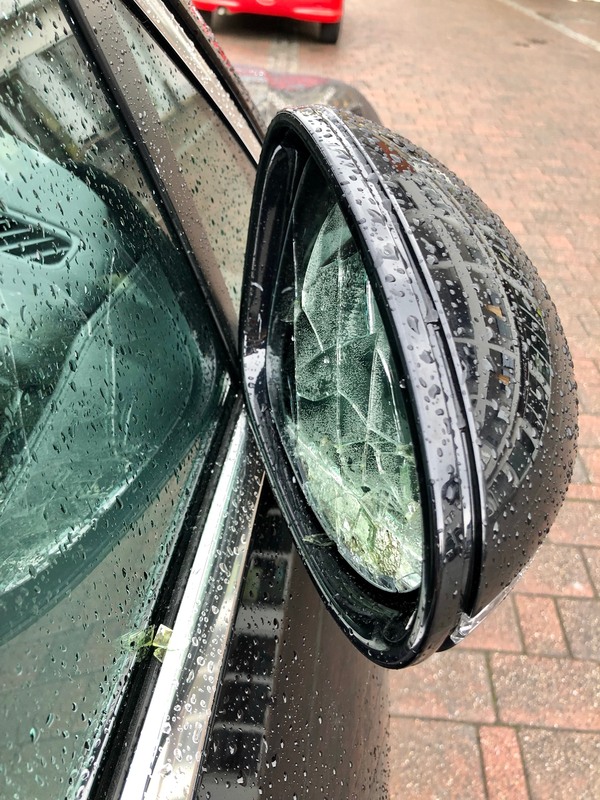 Returning to the Macan, I noticed my passenger side mirror had been knocked inwards and the glass was completely smashed! Without any witnesses and with my 3 hours nearly up, I set the navigation back to Frankfurt airport…where I was handed a €602.86 bill for the damages. Heading back into the First Class Terminal (obviously very annoyed at the experience), my evening personal assistant asked how I enjoyed the rental. I explained how the maps hadn’t been loaded as advertised. Although far removed from any responsibility, she sincerely apologized and called over the bartender to make me a drink — espresso martini, stat! It was now 5pm, so I took a seat in the dining area with only 1 other guest. 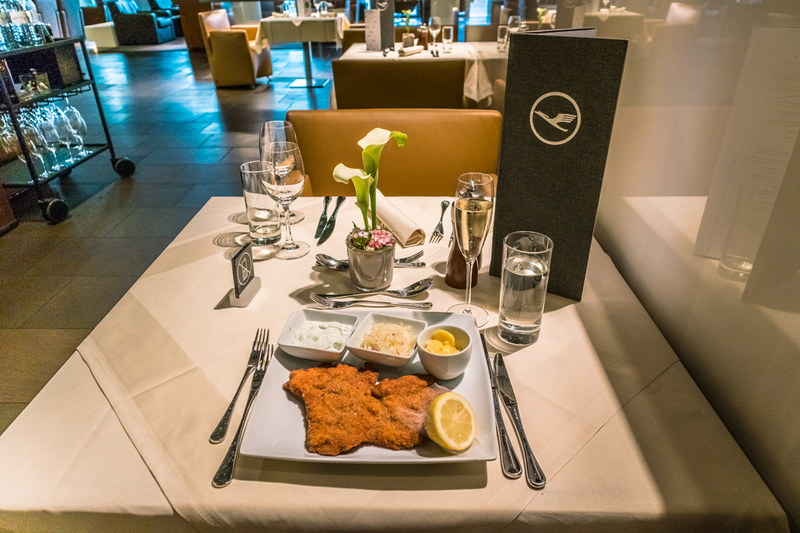 I ordered a glass of the Ruinart champagne and a Wiener schnitzel, which was one of the nicest, most succulent, schnitzels I’ve ever eaten! 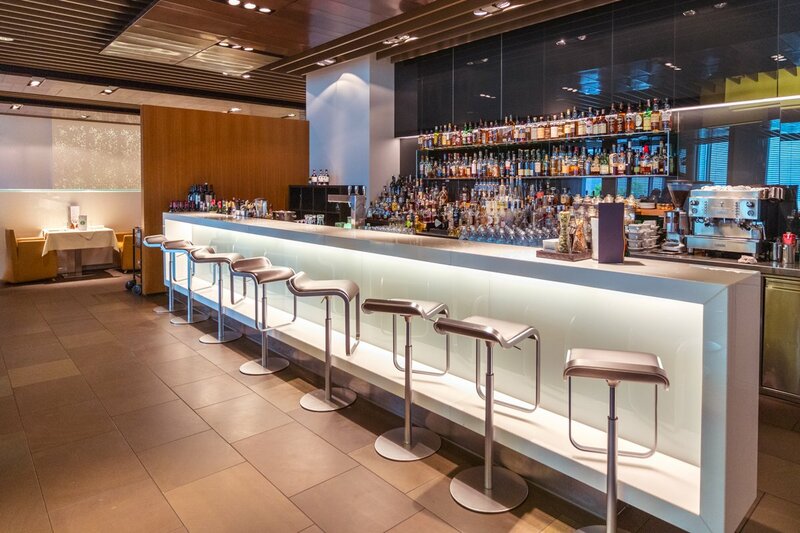 During dinner, the bartender said I could take my pick from any the bottles of wine on the wall, because they were sorry the Avis experience didn’t meet Lufthansa’s high service standards. Such a lovely gesture! 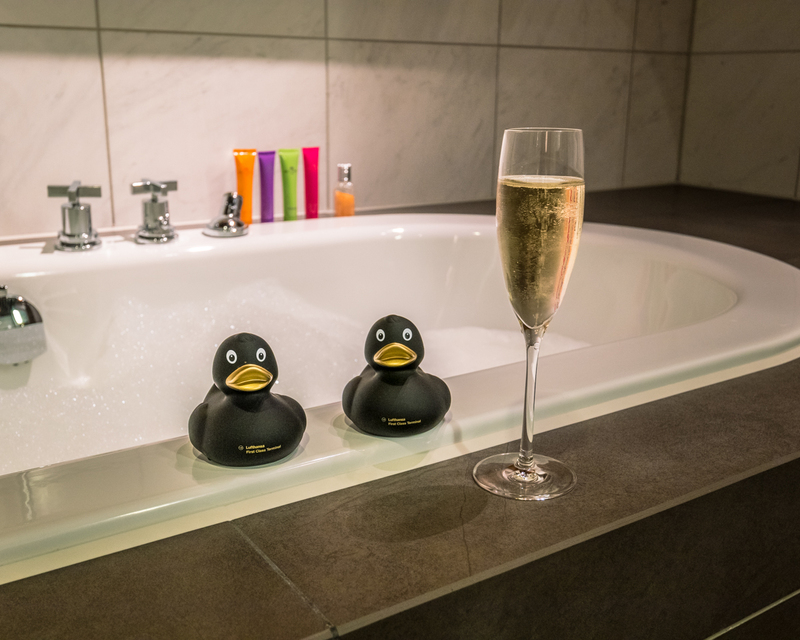 With just 2 hours to go before boarding, it was time to grab my glass of champagne and have a soak in the bath. Yes, that’s right, they have a bath! And more rubber duckies. While I soaked in the bathtub, the bathroom attendant even ironed a fresh shirt for me. Just before 9pm, my personal assistant collected me from the lounge and we headed downstairs to the private immigration desk. 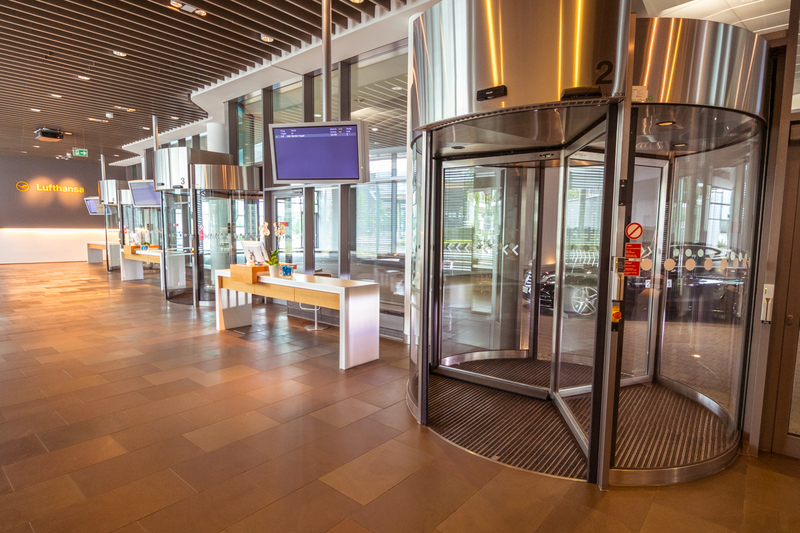 Here, my passport is waiting to be stamped and I’m escorted through the revolving doors into a Mercedes-Benz S-Class. The drive to the A380 was over way too quickly — it took literally 29 seconds. Stepping out of the car, I couldn’t wipe the smile from my face…this avgeek was in heaven! The Lufthansa team member was happy to take a few photos before escorting me into a lift, straight up to the aerobridge, and onto the plane. AMAZING! After taking my seat, I was greeted by the purser, Tina, who came walking through the cabin with incredible energy, a spring in her step, and an enormous smile on her face. 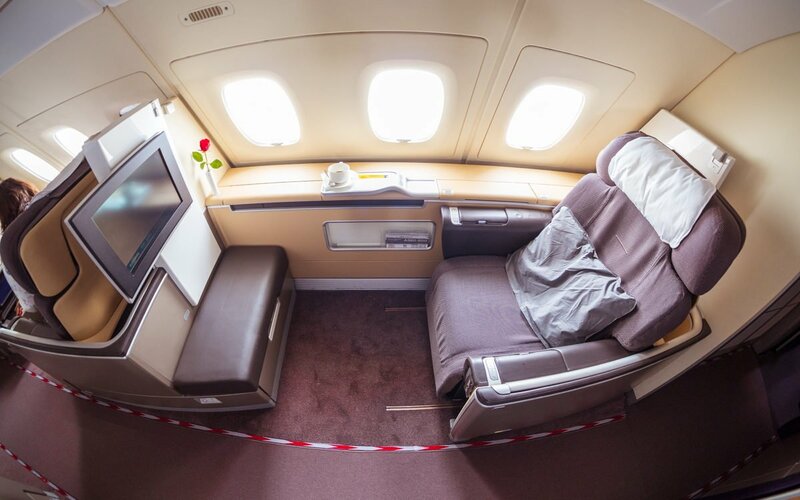 She asked if I had flown first class on Lufthansa before, and I told her it was my first time — she replied that she would make sure it was perfect. She introduced me to 2 crew members who would be looking after me, Matthias and Opal. 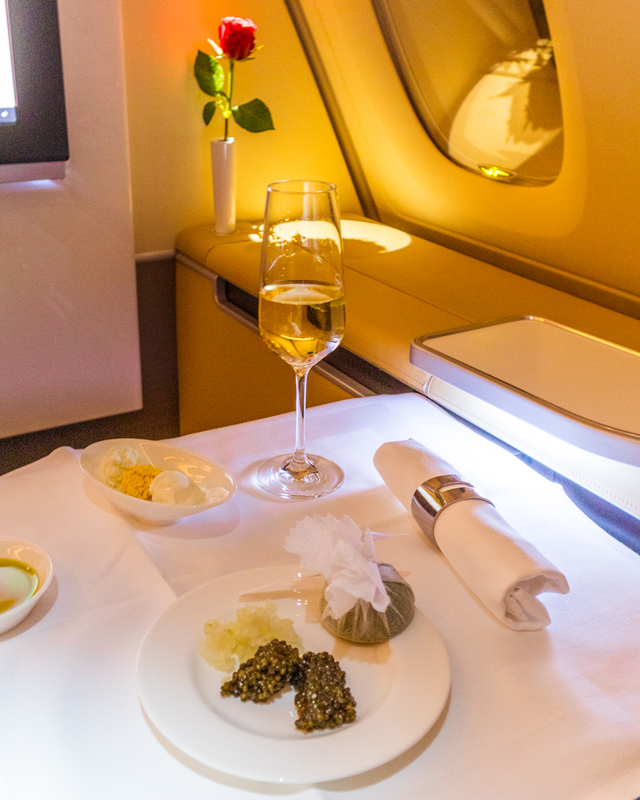 While this was my first Lufthansa first class flight, Tina explained it was Opal’s last flight before retiring, so they’d be popping the champagne to celebrate when we arrived in Singapore. 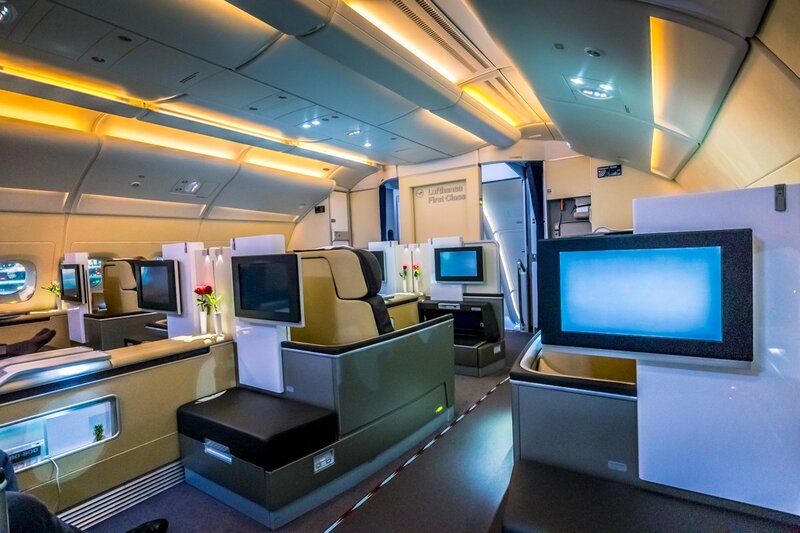 The 4-class Airbus A380 aircraft features 8 open first class suites configured in a 1-2-1 layout. On this flight there were 2 vacant seats. There is no faux wood or blingy gold trim to be seen in this cabin, just meticulously styled, understated, and very elegant suites. 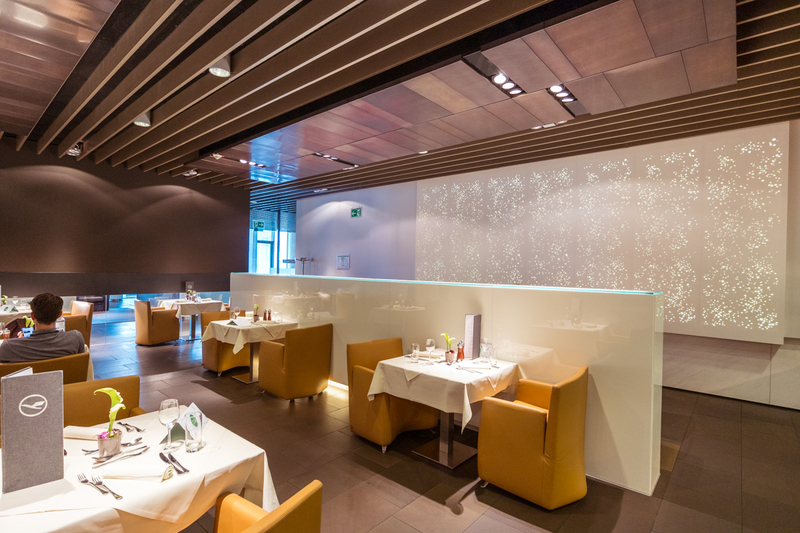 The materials and color palette are shared with the Frankfurt First Class Terminal. In case you need a reminder after all the cocktails and champagne in the lounge, you’ll see a large illuminated “Lufthansa First Class” sign on the bulkhead. 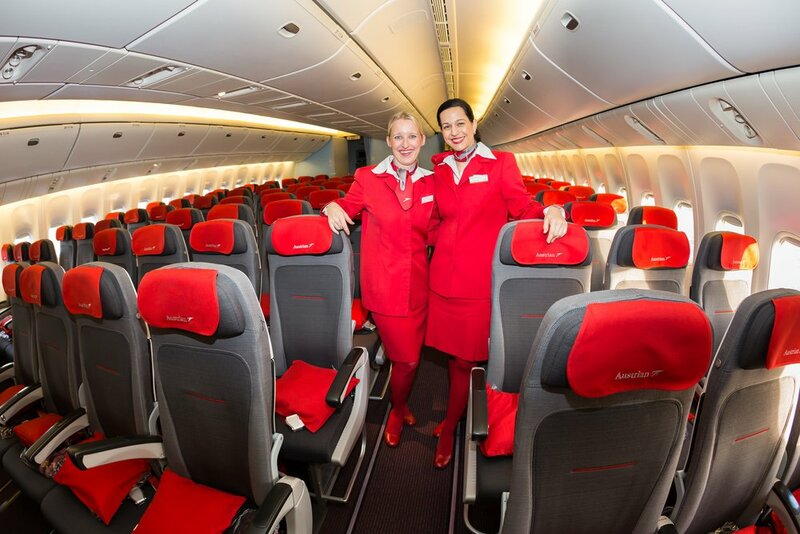 The cabin feels enormous as there are no overhead bins (not even on the window sides). 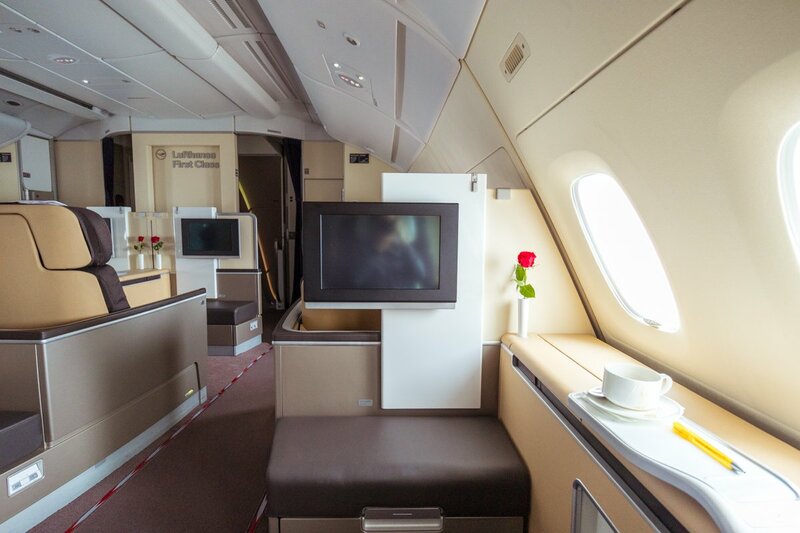 But with no closing doors to the suites, you are left feeling a little exposed to the rest of the cabin. 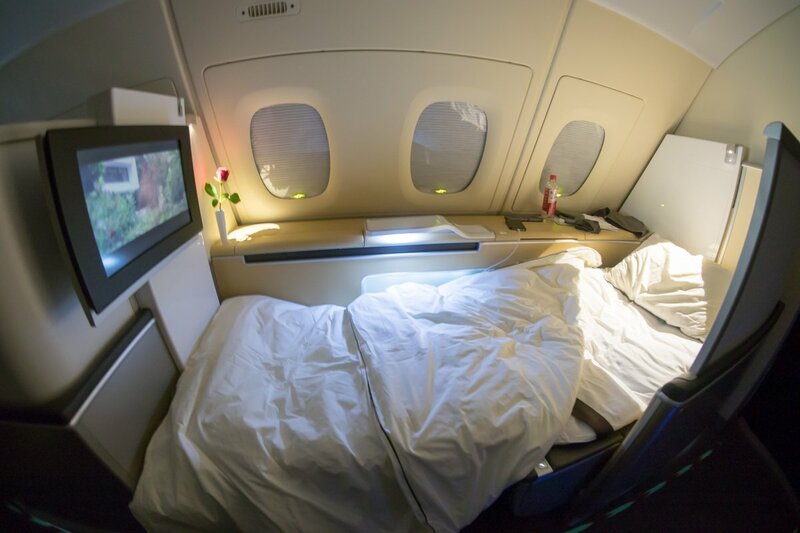 I was seated in 2K and often caught the eye of my neighbor across the aisle in 2G, until the top of our ascent when the privacy partition can be raised around the seat. 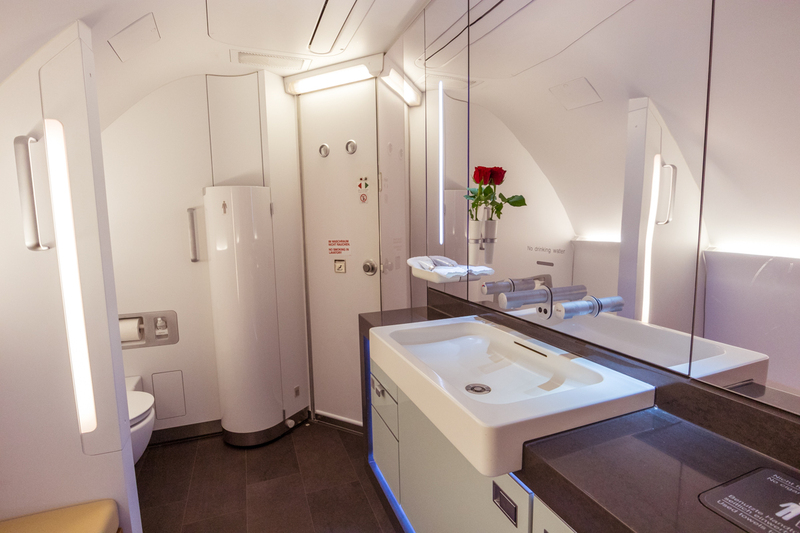 While both lavatories at the front of the cabin are large and feature a urinal for the men, there are no showers like on Etihad or Emirates A380s. Light, comfortable PJs are provided, and the bed is made with very soft linen. The only benefit of the open suite is the airflow around it during the night. The cabin was kept cool overnight, and I slept very well for over 6 hours. Before take-off, 1995 vintage Charles Heidsieck Blanc des Millenaires Champagne is served. 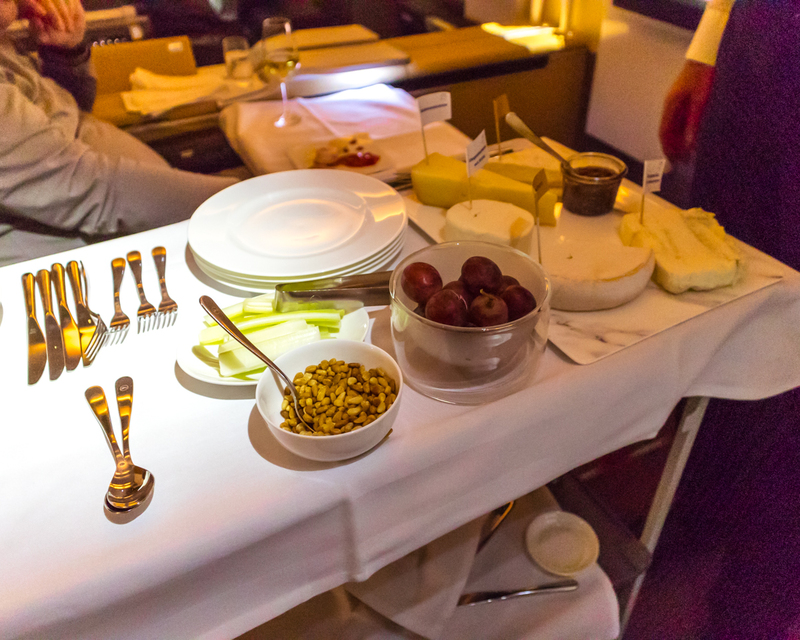 The meal service kicks off with Lufthansa’s signature caviar trolley wheeling into the cabin. The crew portion out servings of the delicious pearly delicacy along with traditional garnishes, which can either be paired with champagne and/or Beluga Noble vodka. The menu indicates a “choice of appetisers,” but after the Caviar I’m served all 3 other appetizers featuring duck tartare, tart of halibut, vinegared apricots, and a salad. I decided on the lamb, which was cooked to perfection and full of flavor. Matthias recommended the 2008 Chateau Langoa Barton red, which is worth around $150 a bottle on the ground and paired excellently with the lamb. 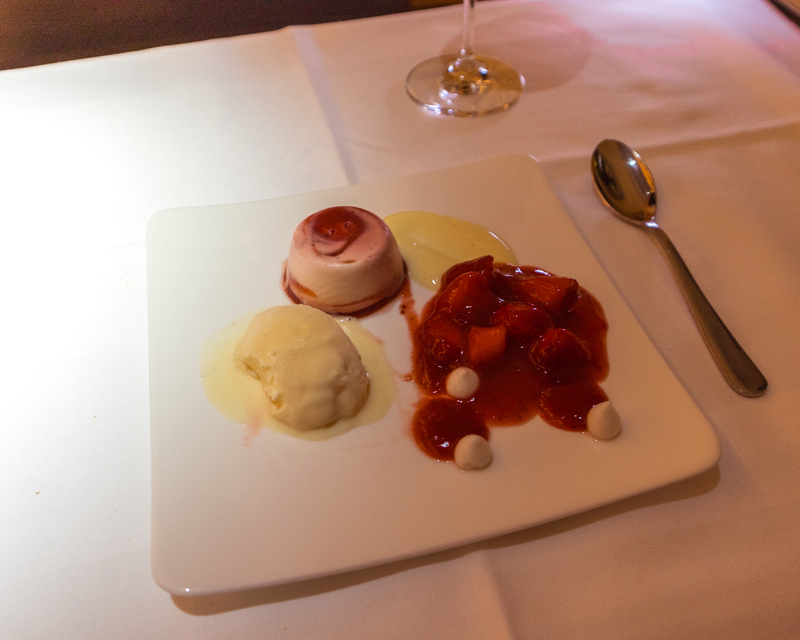 By this time I was quite full (I had basically been eating nonstop since arriving at the airport 14 hours earlier), but for the purpose of this review I thought I had better try a dessert! 😊 The variation of strawberries tasted just as good as it looked. I couldn’t pass up the scrambled eggs with chives, which are freshly prepared by the crew instead of just reheated like on most airlines. They were easily the nicest eggs I’ve been served on a plane. All first class guests receive a free Wi-Fi pass for the entire flight worth €17, but the speeds topped out at 0.31 mbps download and 0.18 mbps for upload (making it basically unusable). The TV is fixed above the ottoman and is on the small size at just 17″ considering the distance from the seat. The user interface was also slow to respond using the remote control. Luckily I was too busy enjoying the rest of the onboard experience to watch anything. 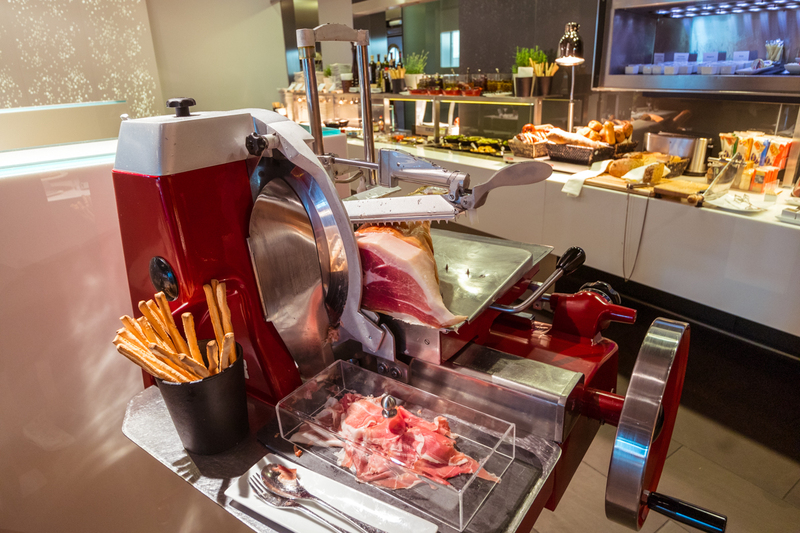 The crew and service couldn’t be faulted. 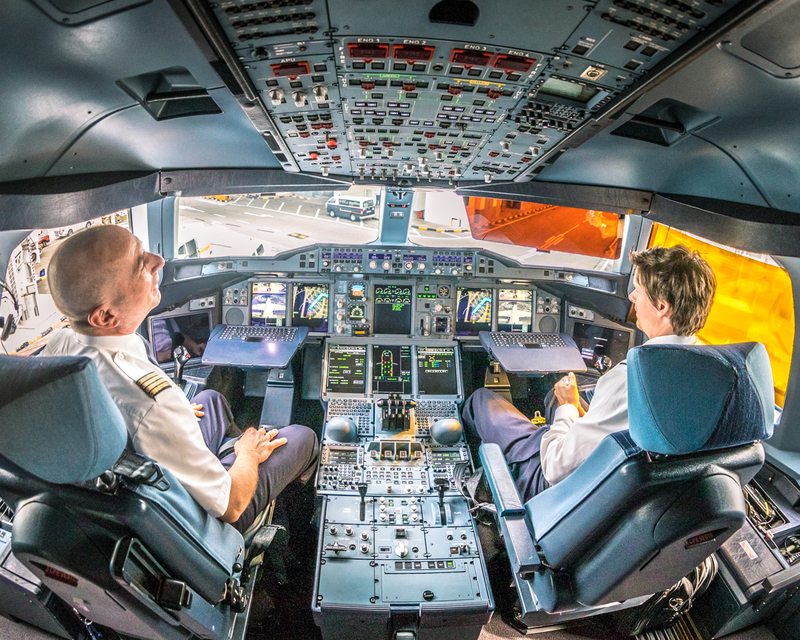 Before descending into Singapore, Matthias was curious about all my camera gear and YouTube videos, so he asked if I wanted to see the crew rest and cockpit after landing. Tina piped in as she bounded back through the cabin with her original vigor and enthusiasm: “Absolutely you must, we insist, it’s a must see!” She was fabulous! After exiting through immigration, I noticed a lady at the baggage carousel holding a sign with my name on it. She has my suitcase, while 500+ other passengers from the flight try to fit around the carousel. After planning this flight for 11 months, I had set high expectations and was a bit concerned it might not live up to the hype. 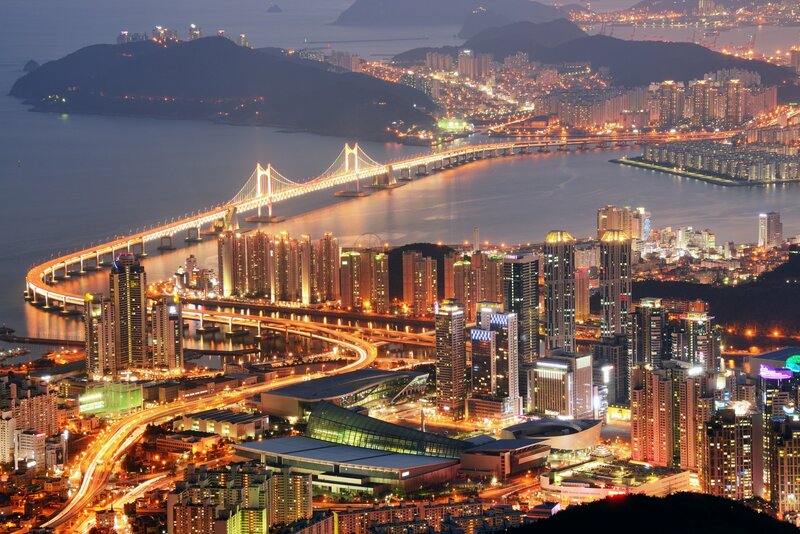 But this experience exceeded all my expectations and was one of my all-time favorite flights. 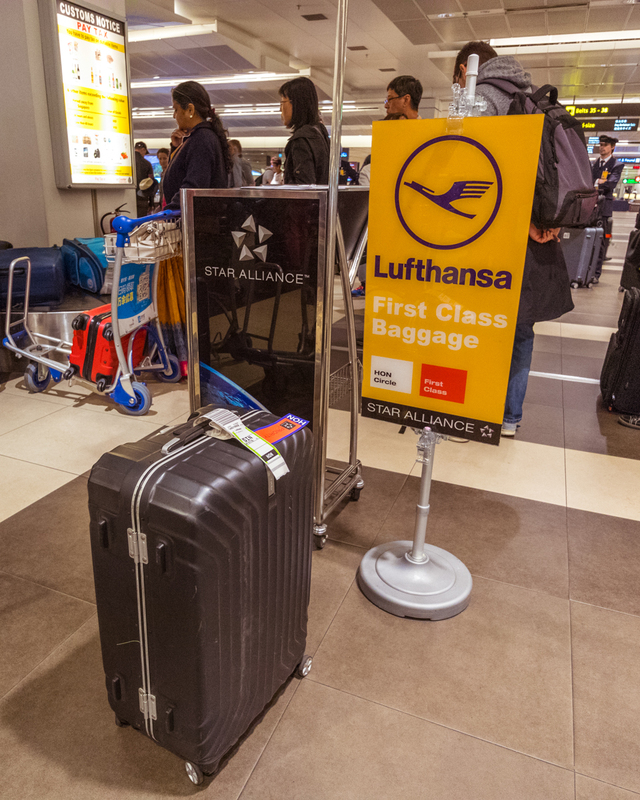 While the onboard hard-product isn’t competitive with the larger and more private enclosed suites of other carriers, the Lufthansa first class service was unmatched — from the moment I arrived at the airport in Frankfurt to collecting my bag in Singapore. 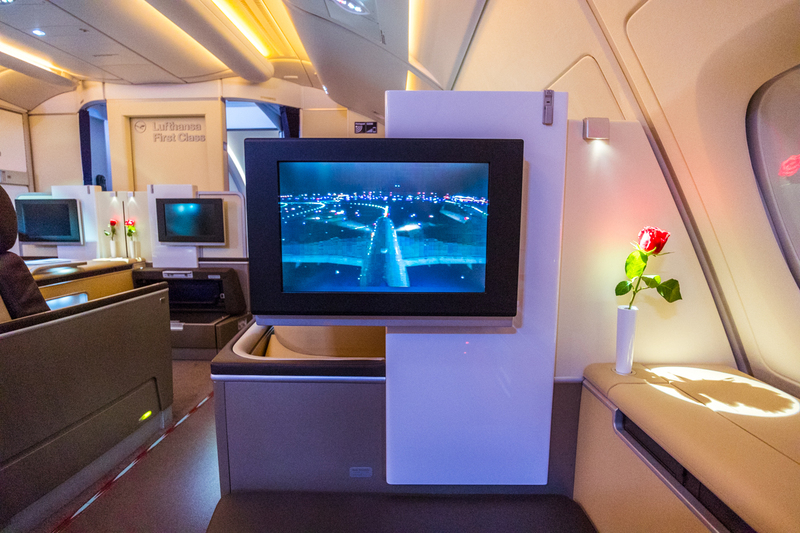 Add to this the incredible First Class Terminal experience in Frankfurt, being driven to the aircraft in a Mercedes S-Class, standing alongside an A380 just before departure, delicious food and beverages, and a private tour of the cockpit makes for a 5-star experience. Even at 12 hours and 20 minutes, I wished the flight were longer! My only complaint is that Lufthansa needs to review its relationship with Avis, as the experience advertised isn’t the one delivered. Thankfully I paid for the car rental with my Platinum Card® from American Express, and I was reimbursed for the damages in just 3 days after lodging the claim online. I’m flying back to Europe in September for work, so as you can imagine, I already have ExpertFlyer alerts set up and my fingers crossed again waiting for that magic notification T-14 days out! 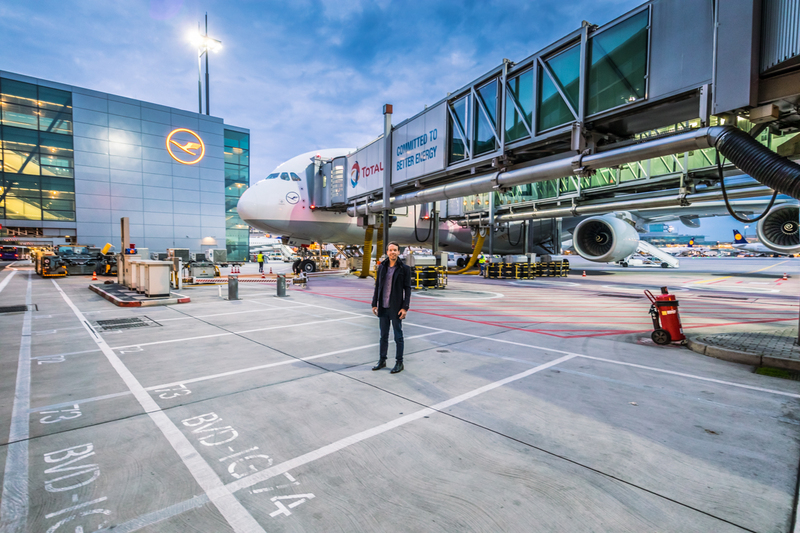 Thank you for this wonderful account of your Lufthansa experience. Until now I was unsure of what that experience might entail, but we will be looking into flying Lufthansa for a future trip. Looking forward to reading more of your adventures. Hi Denise! We are so happy that you found our First Class Review helpful! 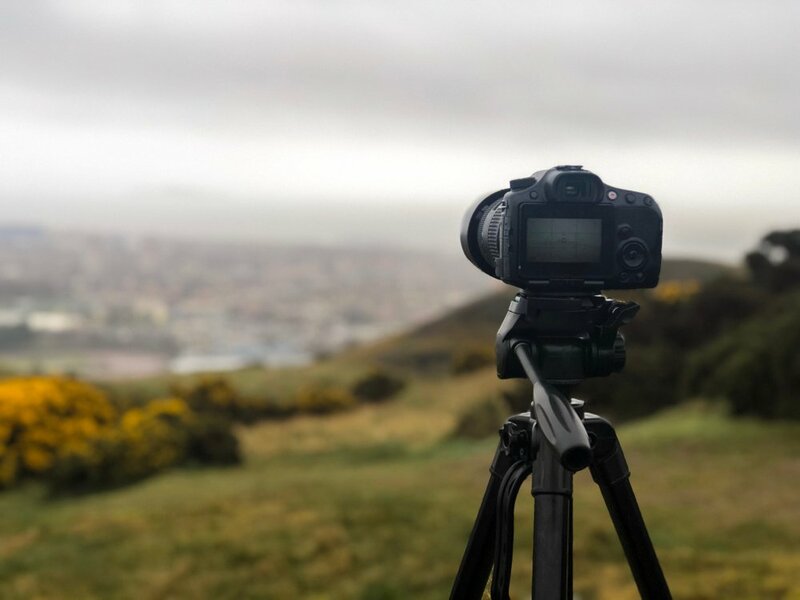 We publish new guides, reviews, and other posts all the time, so keep your eyes peeled for this. Thank you! Just arrived on a JNB-FRA-IAD segment on LH First and couldn’t agree more with your excitement and observations. The understated ‘hard product’ is more than made up for in the ‘soft product’. Pampered from start to finish. In Jo’burg, basically, hand held all the way to the SA Lounge, then to the gate. Arriving in FRA, I was a bit “on my own” to find the FCT. But once I was there, man, the machine kicks into high gear. With four other passengers on my connecting flight, I didn’t get one of the Porsches or MB sedans, but parking under the nose of the 747-8 was pretty nuts! On arrival in Dulles, they do the same, pick you up plane-side and take you directly to Customs. If I hadn’t had luggage, I would have easily been off the plane and in my car in less than 20 minutes! Again, could go on and on…am now waiting to see if my upgrades for the return come through!!! Amazing! Thanks for sharing Fernando, sounds like you’re having a blast!